Basic intrusion detection is one of the lowest-cost systems in the security realm, at least in regards to equipment cost. With panels ranging from below $100 to nearly $1,000, options exist for many budgets. 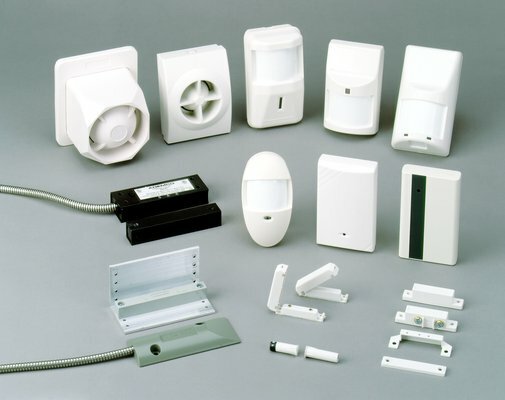 Basic sensors are inexpensive as well, with magnetic door/window contacts available for $5 or less, and PIR motion detectors for $20-30. However, upfront installation costs and recurring monitoring costs cannot be ignored, as they greatly outweigh the material cost of the system. Installation may prove pricey depending on the environment in which the system is being installed, and how secure it must be. If aesthetics are a concern, installing recessed contacts in door and/or window frames is often time-consuming and expensive. For this reason, installers and owners often resort to surface-mount contacts instead. Wireless devices (which we’ll touch upon later) also reduce installation costs, but greatly increase equipment costs. Monitoring is without a doubt the largest expense incurred by owners of intrusion detection systems. Cost per month of monitoring may range from $15 to $50, depending on quantity and quality of services offered. At these rates, even discount alarm monitoring overtakes the cost of most equipment in a year. For this reason, many home and business owners are investigating or utilizing self-monitored systems. Intrusion detection design is, without a doubt, one of the most variable practices in the security field. If you ask ten installers or designers, you might hear ten opinions on how the system should be designed. Some believe door contacts are all that is needed. Other believe motion and glass break detectors are absolutely necessary throughout a facility. The truth typically lies somewhere between these two philosophies. Perimeter: The first layer to be secured, the perimeter consists of doors and operable windows. These are equipped with contacts to detect intrusion. Inoperable windows may be protected with glass break sensors, but care should be taken, and the drawbacks of these sensors considered (see below), before they are installed. Door contacts are the minimum protection any intrusion detection system should be designed with. Their low cost contributes to their use as well. Contacts on entrance doors are programmed so that they do not alarm instantly, but begin a countdown, called the entry delay. This delay allows staff to enter and disarm the system without triggering an alarm. Outer interior: The next area to consider securing is the interior, specifically, the outer reaches of the facility, such as hallways near entrances and exits. Add motion detectors for a second layer of security, so that if any perimeter sensors fail or are defeated, the motion detectors allow a second opportunity for detection. These zones are typically programmed for instant alarming, so any disturbance immediately triggers an alarm, with no delay. Motion detectors near entrances are sometimes programmed to respect the entry delay, to avoid accidental activation when staff enter. Inner interior: Finally, secure the inner areas of the facility. These areas normally receive the least attention, since criminals must make it past the perimeter, and then the first interior layer of sensors to reach them. The only other way to move freely about the interior is to hide while the building is not secured, and avoid detection until all occupants have left. Then the subject may operate freely, only passing through the alarmed zones at the perimeter when leaving, at which point it’s generally too late for responders to intercept. How do I select a panel? Capacity: How many devices will be connected to your system? This is the number one factor that must be considered when installing an intrusion detection system. Nothing else matters if the system is not large enough to support the number of devices. This may range from two to 500 devices, with options in between. Larger panels are normally of the addressable variety, which we’ll touch upon in a moment. Partitioning: In an intrusion detection system, partitions refer to spaces within the building which may be armed and disarmed independently. This division may be because of different work units in a facility, such as admin and warehouse, or it may be multiple tenants within a building. Partitioning prevents installation of multiple panels, especially in the multi-tenant facility case, and should be considered when selecting a panel. Addressability: To facilitate installation of larger systems, some panels support addressable devices. This allows a single circulating cable loop to be installed throughout a building, supplying power to all devices. The devices are then addressed (via DIP switches or other means), so they report to the panel as individual zones, instead of as a group. This saves substantial labor in large systems, since it avoids homerunning cables from distant devices to the panel. For everyday use, such as residential and small commercial systems, though, it is much less of a factor. In these smaller systems, running cables directly to devices is much less of an issue. Wireless: Wireless capability varies between manufacturers as well as within each manufacturer’s line. Not every panel will support wireless devices, so this must be taken into consideration. Add-on wireless receivers may also be used, but these generally cost more than built-in wireless capability. We’ll discuss wireless more below. Functionality: Specific functionality requirements may need to be taken into account as well, such as: video verification capability, integration to building or home automation systems such as lighting and HVAC, graphic touchscreen keypads or those with voice capability, and others. These needs must be taken into consideration when selecting a panel. These items are used to operate the system. The most common device in this category is the keypad. Typically, it consists of a 12-button (0-9, *, #) numeric keypad, along with some function buttons. The user enters his or her code, and then pushes the appropriate function button, such as armed “away”, armed “stay”, disarmed, etc. An LCD display, which may be alphanumeric, or fixed wording, displays system status. Alphanumeric displays provide more information, displaying system status and exact zone information which the installer inputs, such as “Motion Detector - Living Room”. Fixed keypads display only generic conditions, such as “Alarm”, “armed”, and a zone number at most. Fixed keypads are less expensive than alpha, and may be suitable in applications with a limited number of zones, and a limited budget. In the past two to three years, keypads with built-in graphic touchscreens have been brought to market, as well. These keypads allow users to display company logos or photo slide shows, and are generally simpler to use than fixed-key keypads, providing more user instruction. The next most common control device is the keyswitch. This consists simply of a key cylinder on a metal plate, with green and red LED’s. The user inserts a key and turns in one direction to arm the system, and the other to disarm. This is common in lower-security facilities, as it presents the obvious security risk of lost keys. Anyone finding a key may gain access to the system. These devices are the bulk of the intrusion detection system, and what are used to trigger alarms. There are many different types of sensors and other inputs that may be utilized in any given system. Door/window contacts: In security systems today, the most common device in use is the magnetic contact. Typically consisting of a reed switch encapsulated in various form factors, the contact simply opens and closed when a magnetic is in close proximity to it, or removed. In older systems, mechanical plunger or roller switches were used, but these devices have become less common, since they wear out much faster than magnetic contacts. One of few new advancements in magnetic switches comes from Magnasphere, whose spherical magnetic technology is claimed to be much more secure and defeat-resistant than the reed switch.Magnetic contacts come in multiple form factors, surface mount and recessed. Special application contacts are made for overhead doors, gates, and roof hatches. Balanced magnetic switches: In most applications, door contacts contain only one set of physical contacts, reed switch or otherwise. In some higher-security environments, however, each device may contain multiple switches, each with a corresponding magnet, and of the opposite polarity. This makes these contacts more resistant to defeat by an external magnet, since applying the magnet wrong will actually put the door into alarm by forcing a contact of opposite polarity to close. Motion detectors: Motion detectors the second most common device in use in the modern intrusion detection system. Most of these devices are of the passive infrared type, but other options exist, such as microwave, ultrasonic, and active infrared. Large microwave detectors are typically used for perimeter detection in outdoor high-security environments, not so much in indoor installation. Ultrasonic and active infrared detectors are rarely used in place of PIR’s today, but may have their use in some special applications. Also popular is the dual-technology detector, which normally uses microwave and passive infrared technologies in an AND configuration, meaning both types of detector must be triggered in order for an alarm to be generated. This greatly reduces the probability of false alarm, since microwave and PIR are complimentary technologies. Glass break sensors: To detect glass breakage, two types of detectors are used: contact and audible. Contact detectors are attached directly to the glass pane and sense certain frequencies of vibration created by breaking glass. These are prone to false alarms, however, from shock, and are now less common than audible detectors. Audible detectors listen for the sound of breaking glass and are typically wall or ceiling mounted about 20’-25’ away from the glass to be protected. While not quite so prone to false alarms, they have been known to alarm on the sound of someone dropping keys on a desk, and if the sensitivity is not set and tested properly, may never alarm at all. Thorough testing is necessary to assure the sensor is working. Hold-up switches/panic buttons: In order to protect staff and notify authorities in case of a robbery or other event, intrusion detection systems are sometimes equipped with panic buttons. These come in a few varieties. Most are mounted beneath a desk or counter, and staff push a button on its surface to activate. Most of this style of switch are latching, and require a special tool to unlatch, to prevent the panic signal from being disrupted before the alarm is responded to in the proper manner (police or guard force intervention). Hold-up switches may also be mounted on a foot rail or built into a cash drawer for more covert operation. Wireless devices carried by staff may also be used. Others for Special Circumstances: There are other devices that may be connected to an intrusion detection system, which are not always considered, or may be connected only in special circumstances. 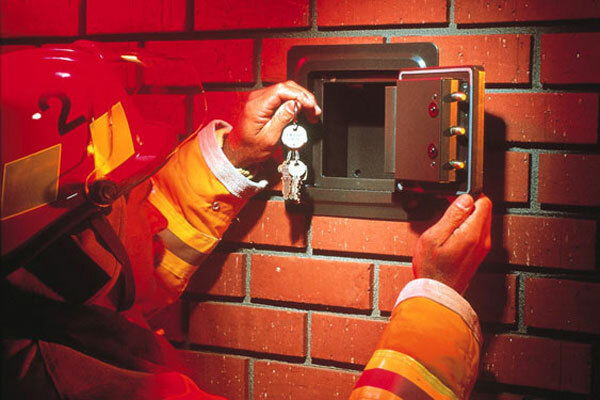 Vaults: Vaults and safes are often protected with multiple alarm devices. Normally, in new installations, these are built into the safe when it’s built, but they may also be retrofitted. Vault sensors may include vibration, tilt, or tamper, or any combination of all three. Pool alarms: Not often thought of, specialized pool detection sensors and systems (such as SonarGuard) are sometimes provided to detect unauthorized use of pools. These typically operate via sonar or audio detection, and are connected to an input of the intrusion detection panel. Environmental: Providing notification of off-normal environmental conditions, temperature and humidity sensors may be connected to the intrusion detection system, as well. These sensors may detect only a high limit, a low limit, or a low and high limit both. Some systems, such asWinland's EA800feature wireless sensor and logging options, as well. This is useful for the food service industry which sometimes must report to the FDA, as well as healthcare, where refrigerators for medications and donor organs are required to be logged. Fluid sensors: These sensors are used to detect the presence of liquids in a specific area. 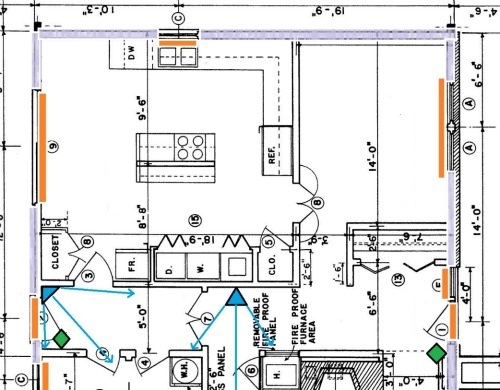 Consisting of two probes which touch the floor in the area to be detected, the presence of a sufficient amount of fluid to short the two contacts together triggers an alarm. Range issues: We have never seen a wireless security system that did not have range far below the manufacturer’s claimed range. In most cases, system specs will be quoted as open air range, with little indication of what can really be expected. We’ve found that metal stud walls render wireless devices nearly useless. In wood stud walls, we have seen devices work reliably out to about 200’. We strongly recommend users request that installing companies test wireless devices before installing them, to avoid potential problems. Compatibility: Not every manufacturer of intrusion detection system provides compatible wireless devices. Universal options, such as Inovonics may be used in these cases, but require numerous input modules, and are far less streamlined than proprietary, integrated wireless solutions. Battery Maintenance: While the rated life of batteries in wireless sensors is normally 3-4 years, users must keep in mind that this means they will be making a time and material investment periodically, to change all these batteries. Wireless sensors often use lithium-ion batteries, as well, instead of less expensive alkaline batteries. Central station monitoring: The most common monitoring method for intrusion detection systems is via central station monitoring. The alarm panel is connected to the central station via telephone lines or IP. Signals are received and trigger events on operator PC’s via automation software connected to the central station receiver. The operator follows procedures as outlined by the customer in responding to these alarms. This may be a list of staff to be called for certain alarms, such as environmental or trouble signals, while intrusions normally call for law enforcement to be notified. IP communicators, an advancement in communicators in the past few years, provide a few advantages over telco dialers. Generally, they’re more supervised. 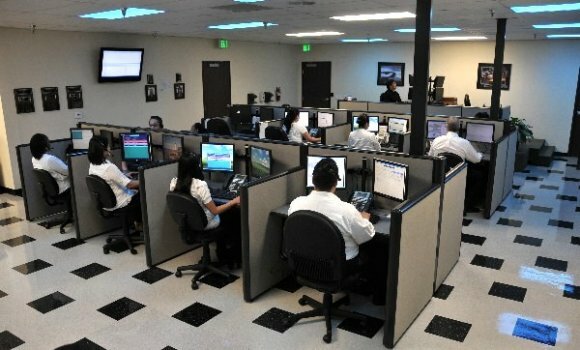 Where phone lines are checked once or twice per day by the central station, or sometimes not at all, IP communicators may be supervised at much smaller intervals (seconds or minutes), since the connection is always on. IP communicators also eliminate the need to install a landline for the security system, which may save $10-20 dollars per month if one does not exist. Voice dialer: Voice dialers connect to relay outputs on the panel, which trigger one or more voice messages when the relay is activated. Basic dialers allow only one message to be recorded and triggered, while other models allow for two or more. Multiple messages allow voice notification of more than simply “alarm”. For instance, one message may notify the user of security alarm conditions, another, fire alarm, and a third, environmental troubles. The main drawback of this is that it requires a phone line. If cut, there is no supervision and no way of knowing that an alarm notification won’t be sent. Voice dialers can be found online for less than $100 dollars. Internet: To facilitate monitoring via web browser, email, or text message, Ethernet I/O modules are often used. These modules are connected to the alarm system in the same way as voice dialers. However, instead of dialing a pre-determined phone number, the module will send an email or text message to one or more addresses. Most also have an HTML or Flash-based web interface, to enable monitoring from a web browser. These modules are a bit more expensive than voice dialers, costing about $200 and up, depending on number of inputs. An intrusion detection system is of little value without some way of notifying anyone of an alarm. There are differing philosophies about notification. One says that sounders should be highly audible, to scare off the perpetrator as soon as possible, before they should steal anything. The other philosophy argues that alarms should be silent, so that law enforcement may interrupt and apprehend the criminal, increasing the chances of prosecution. We believe the first philosophy is generally more useful. Burglar alarms are rarely anywhere near the top of police priorities, so response time may be extremely slow, unless the burglary is verified. Video verification systems, such as Videofied, are becoming more popular because of this. This category basically consists of three types of devices: dialers, sounders, and strobes. Dialers: Simply put, the dialer dials. Historically, this device was connected to a phone line, and upon alarm, it dialed one or more parties to notify them of the alarm. This could be a voice message or a data transmission. With the prevalence of the internet and decline in phone line customers, however, IP “dialers” have become much more common. Instead of actually dialing a central station, the IP communicator transfers this data via the Internet, where it’s received by a specialized receiver. The final option is the digital input monitoring interface. This device (such as the HW Damocles) sends an email when a device attached to one of its inputs is triggered. Sounders: This devices come in the form of piezo speakers, horns, or mechanical bells. Piezos are most common at this point. Horns are used when higher volume is needed. Bells have become much less common in recent years, but are still occasionally used. Keypads generally contain a piezo sounder that will beep upon alarm unless programmed to be silent. Strobes: Strobes are generally located on the exterior of a building to alert neighbors to alarm, especially when ordinances disallow audible alarms to be triggered.